Ethan and Talia's World: Eating With a Spoon! Today is a historic day. Ethan ate his first semi solids! We prepared some rice-cereal mixed with Mummy's milk. Here it is looking errr... not so yummy from my perspective. 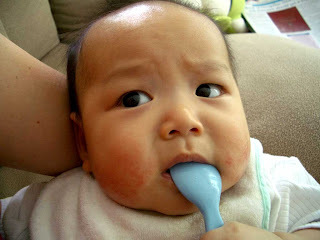 Some people have asked us whether we need to try solids so soon. Ethan is now 1 week shy of 5 months old. Baby manuals say around 4-6 months, depending on the individual baby. Ethan's been happpy with his milk and hasn't been waking up due to hunger or requesting more frequent feeds, but we did notice that the last couple of days he's been biting more (and harder) and has been "smacking his lips". 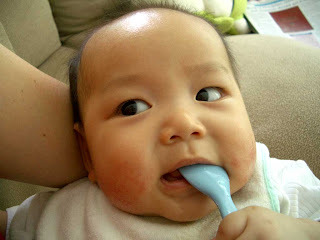 We've also been giving him a spoon to play with on occasion so that he grows accustomed to this new toy. Armed with a bib and the semi-solid cereal we began just before lunch time! Puzzled expressions soon gave way to swallowing attempts with cereal dribbling down his chin. Then he began to fuss, which was hard to figure out whether it was due to not liking it, that he wasn't able to swallow, or that the spoonfuls weren't coming fast enough. After a few more minutes, Ethan began getting the hang of it as we gingerly fed him a bit more. More fuss cos he was hungry and he couldn't eat it fast enough, so Renata nursed him a while, then we fed him some more cereal. This second round was a winner! He lapped it up and really liked the new taste. For a first-try, Ethan's performance was quite stellar. We were prepared for most of the food to end up on the floor, but we think he actually swallowed more than half of the cereal (1 tbl spoon with 50ml milk). Here he is after the feed. He looked very contented and pleased and was still continuing to bite and chew, so we gave him another spoon to nibble on! The best thing about it was how satisfied he looked after this new meal. He went into a drowsy state, staring at his mobile - a look that we last saw when he was much younger and very full on milk. He's now sleeping... well... like a baby!